I was smitten when I saw this leather bow cuff from Of a Kind. But...the price was pretty steep for my DIY-life/budget. I knew I could make a knock-off for much cheaper. Yes, I used pleather instead of leather, but I think it looks just as cute! Snap Fastener Kit -I've linked you to the size of fasteners I used (16 7/16") but you will need the actual kit. I got mine at JoAnn's. Step One: Cut your length of pleather according to your (or the recipient's) wrist size. I cut mine 12 inches long and 3 1/2 inches wide. For the little girls' cuffs I cut the length 8 inches long and 2 1/2 inches wide. When making your measurements, take into account a 1/4 inch seam allowance on each side. Step Two: Fold the pleather strip in half with the right sides facing or cut it into two separate pieces. Folding it in half was easier for me. Step Three: Sew down each side leaving the top ends open. Step Four: Turn the right side out. Step Five: Top stitch down both sides. I used a coordinating brown thread. Step Six: If you want your ends rounded - which I think looks better - trace around a round edge and cut. Step Seven: Top stitch around your rounded edge. Step Eight: Now to make the bow. First cut a small piece of pleather, fold in thirds and glue the edges down. This will be the bow's center. Step Nine: Fold your cuff in half at the middle. Step Ten: Then fold the sides back down. If you want two dimples in your bow (instead of one as shown) do the opposite. Push the middle up and fold the sides up to meet it. Step Eleven: Wrap your small piece of pleather around the center and glue in place. I clamped mine down with a hair clip for about a 1/2 hour to ensure a good gold. This angle shows you what the cuff would look like with two dimples. Step Twelve: Once dry, add your hardware. I used a Dritz snap fastener kit purchased at JoAnn's- size 16 7/16". The kit comes with really simple instructions on how to use. Voila! 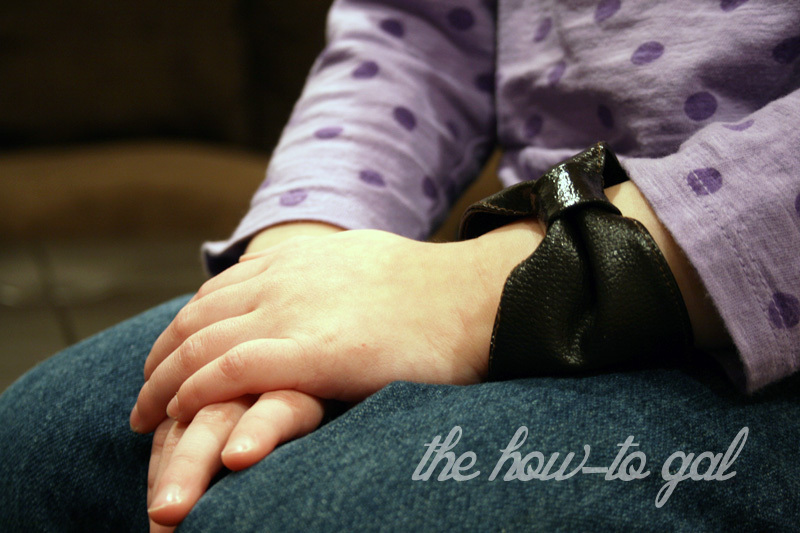 This picture shows the small leather cuff I made for my little girl. She loves it and looks super punky and cute in it.